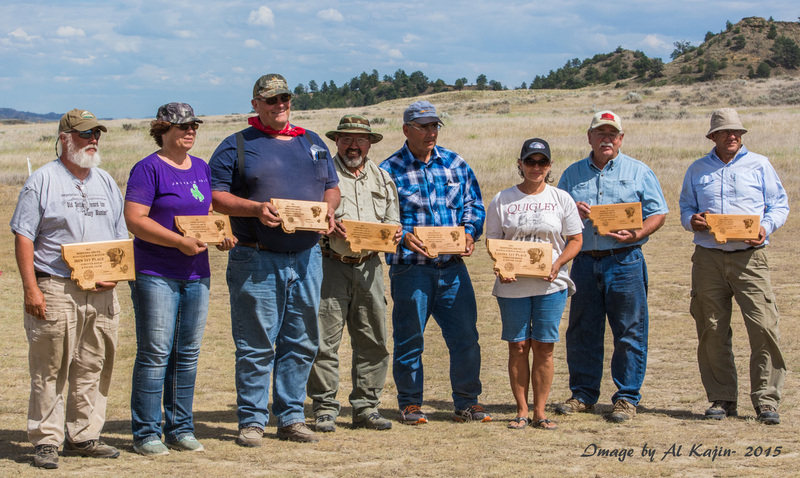 The Montana 1000 yard shoot was held on July 9th, 2017 by the Forsyth Rifle and Pistol Club at the Lee Ranch. The hundred degree plus weekend did not deter the fifty-six shooters who shot at four targets, positioned at 1000 yards, two squares and two octagons. Shooters had one sighter and ten shots for score for a total of forty possible hits. Match winner and first place in Men’s was Wes Gamble of Hysham, Mt with 23 hits, second place was Dave Gamble of Forsyth, with 22 hits who tied with Mike Bucholz, of Hot Springs, SD, that took third with the tie breaker. Fourth was Wes Daems ,of Ennis Mt with 21 hits , and fifth was Ken Heier of Bismarck, ND with 21 hits also . In Ladies class Linda Clendenen, of Amidon ND won with 20 hits and Sam Boyd of Billings won second with 14 hits. Scope winner was Ed Schleichardt of Sheridan, WY with 20 hits. Thank you to the Lee Ranch for hosting the shoot, Road Runner Catering, the scorekeepers and all who helped make this shoot a success, especially the shooters. 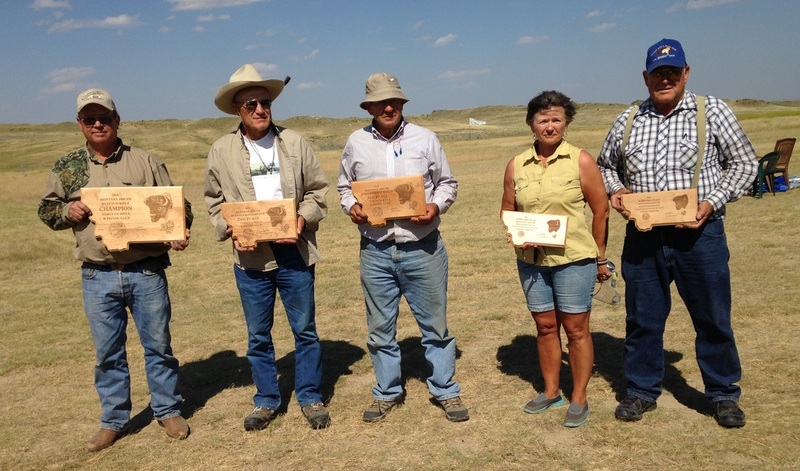 The 2015 Montana 1,000 yard match was held on July 12th at the Lee Ranch with sixty-three shooters in attendance. The temperature could have been uncomfortably warm if not for the wind, while the shooters were lamenting their misfortune to have to contend with such gusts, it did cool one off. There were four targets, two octagon and two squares, each at 1,000 yards, with one sighter and ten shots for score with a total of forty possible hits. Match winner and top lady shooter was Linda Clendenen of Amidon, North Dakota with 22 hits, second place lady was Loyce Ellingrod of Clearmont, Wyoming with 13 hits. Top scope shooter was George Jordan of Billings with 17 hits. 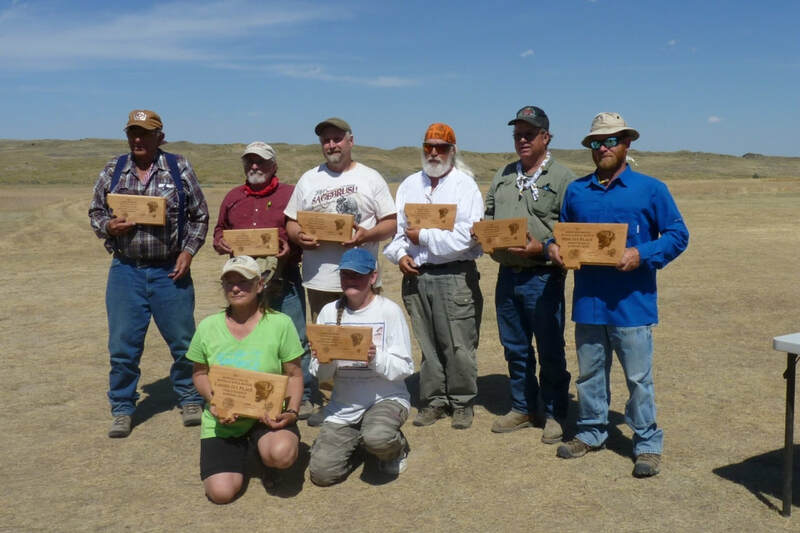 The top men shooters were Mike Buchholz of Hot Springs South Dakota, with 21 hits for first, John Brooker, Casper, WY with 21 hits for second, Mark Boyd of Billings with 20 hits for third, Mark Scott of Billings with 17 hits for fourth, and Mike Herth of Buffalo, Wyoming also with 17 hits for fifth place. There was also a shooter joining us from Savannah, Georgia. A big thank you goes out to the people who make this shoot possible, the Lee Ranch for providing us such an entertaining place to shoot, the club members who help not only at this shoot, but also the monthly shoots and also to the scorekeepers, spotters, shooters and Roadrunner Catering. 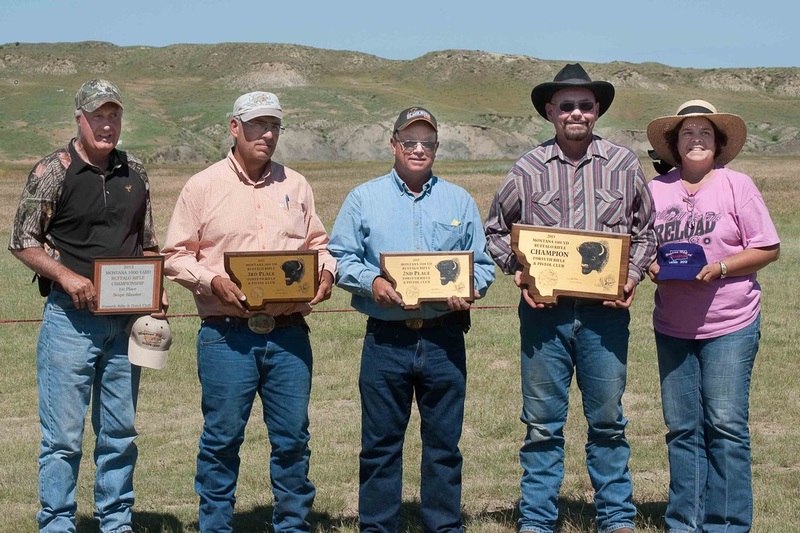 The annual Montana 1,000 Yard Championship was held on July 14, 2014 at the Lee ranch. Seventy-four shooters participated in hot, windy conditions. Shooters from Montana, Wyoming, North Dakota, South Dakota, Nevada, Nebraska, Minnesota and even a young marine stationed at Kings Bay, Georgia joined his grandparents for some challenging shooting. Shooters were allowed one sighter and ten shots for score, at four targets at 1,000 yards for a total of forty. The match winner with a total of 24 hits was Dave Gamble of Forsyth. Three shooters followed with scores of 21. The tiebreaker is the total on the more difficult octagon shaped targets. That sorted the shooters with second place going to Joe Kalus of Buffalo, Wyoming, third place to John Brooker of Casper, Wyoming and fourth place to Randy Ellingrod of Clearmont, Wyoming who won last year’s event. Top scope shooter was Elwyn Brunner of Forsyth with 18 hits. The top lady was Linda Clendenen with 16 hits from Amidon, North Dakota, finishing in a tie with Lori Miller from Frannie ,Wyoming, but Linda won the tie-breaker. 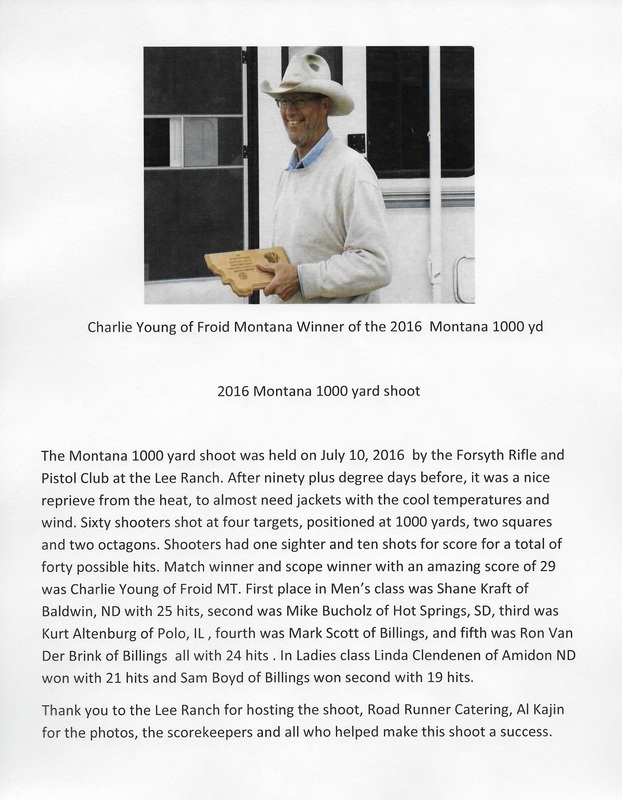 On Sunday, July 14th, the Montana 1000 yard match was held on the Lee Ranch. Sixty-nine shooters competed by shooting four targets, two octagon and two square. The temperature was low eighties, as beautiful of shooting conditions as you could hope for except for "that wind." As always the Lee Ranch likes to provide beautiful scenery and a challenge from a gusty breeze. The winning score for top overall shooter belongs to Randy Ellingrod, Clairmont WY, with 24 hits, second with 23 hits Dave Gamble, two shooters tied for third with 20 hits, however Mark Scott, Billings, won the tie breaker over Toby Crisler, Anaconda. The top ladies shooter was Loyce Ellingrod, Clairmont WY, with 19 hits, top scope shooter was Kenny Boschee Miles City, with 13. The cub scout troop provided a wonderful lunch for the hungry shooters and guests. The scorekeepers did an excellent job.